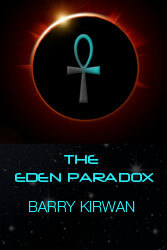 The following is a 'deleted scene' from the book The Eden Paradox. The scene is best read after the book, or at least after the chapter called Kurana Bay in Part One of the book, which is where this scene would have occurred. I had to delete certain scenes due to the length of the book, but this is one I always felt should have stayed. This is therefore like the 'director's cut' :-) Hope you enjoy it. The door slid closed behind Blake. He stood a moment behind where the interviewer would sit, noting how he would be seen. He walked around the small square table, pulled back his chair and sat down, face to the door and the empty chair, a long rectangular mirror on his left, his back straight. The shrink would be late. Everything Blake did would be monitored. He slowed his breathing, counting each breath. At inbreath 203 the door opened, revealing a man in his late twenties, wearing a white lab coat. He had dark, lank hair, already thinning at the top, cresting a furrowed brow. It gave Blake the overall impression of a young man continually worried or in conflict with his job. The man didn’t salute, though Blake suspected he was a commissioned officer. He must be good, Blake guessed, to interview him, given their age difference. Never under-estimate, he reminded himself. If I get through this, I have the mission. The shrink walked to his chair, raked its metal legs against the floor, and sat down, poker-faced. He dropped a yellow file noisily on the desk, unfastened it and opened a sheaf of papers covered with small type-font, and even smaller handwriting. He then planted a Sensex on the desk – a small, black rectangular box with several glass-covered holes. On seeing it Blake battened down his emotions. The Sensex – Sense Executioner as it was known, analysed all manner of psychological outputs, integrating pheromonal emissions, sweat response, pupil diameter, breathing rate, and speech tone variability; it was the most reliable lie detector ever. Blake tried not to react, knowing that it would already be processing his responses, making judgements, and relaying them live. The shrink leaned back, holding up one of the pieces of paper, a pen held against his lips, reading intently. Blake didn’t move. The interviewer put the sheet down and smiled again at him with holographic warmth. Blake was being dared to try and read it upside-down, but he didn’t oblige. ‘Good morning, Captain Alexander, Sir,’ he said, voice smooth and studied. ‘Just a few points I need to go over with you.’ The man glanced downwards, and began reading aloud. He watched for a reaction when he’d said ‘son’ – he knew this ingrained automatism, a remnant from his upbringing, pissed a lot of people off – but he saw none, nor did the interviewer glance toward the mirror. He’s better than he lets on. The interviewer closed the file, put down the pen, and sat back. ‘I see,’ Blake said. ‘Well, I’ve learned something today.’ He omitted the ‘son’. Blake shifted position in his chair, causing a shrill scraping noise. He’d been anticipating this for the past six months. It always came back to this. They continued to stare at each other, neither one blinking. Blake briefly considered giving a pat, technical answer, but decided against it. He’d been told one thing about the Forces’ psychs – they detect lies and attempts to hide the truth as naturally as a shark smells blood. Glenda had advised him the night before that if it got tricky, give him what all psychs want to see – inner emotion. Blake decided to take her advice, and he had plenty of pent-up emotion on this particular issue. In any case, he wasn’t going to pretend to be someone else to get this command. He leaned forwards. The interviewer leaned forward, too, with an immediate riposte. Their faces were centimetres apart. Blake’s breathing was measured; the interviewer’s was a little heavy, not quite under control. Blake sat back and stared toward the opposite wall, speaking as if from far away. ‘I made, as you say, a tactical decision. We found out about them, those boys, barely men, no older than my son had been. Knew they were being interrogated – tortured – and knew what the enemy had in store for them.’ He paused. It surfaced again. The screaming, the shouting, the flashes of rapid pulse fire in the depth of night, lighting up the blood-soaked carcasses of his men on the floor. ‘For Christ’s sake, shoot Blake! Shoot!’ Zack was yelling at him. He aimed. He fired. He watched it explode. Blake pushed the memory back, deeper. Locked it away again. His right hand twitched. He moved it under the table, though he reckoned the Sensex must have just gone off-scale. He spoke in a quieter voice. ‘There was no time for back-up. They were going to be moved later that day. I talked it over with my men. We knew the odds were lousy. They wanted to go in. War ain’t all maths. Mainly it’s guts. But when you’re out there, in the Burmese jungle, thousands of miles from home, deep behind enemy lines, all you have is each other. It’ll sound clichéd, I know, but the headlines, the rules, the strategies, sometimes they don’t mean squat. You fight to stay alive. You fight to keep those alive that help you stay alive. And then…’ he paused. He got up, walked over to the mirror and put his back to it, facing the interviewer. Blake’s face momentarily allowed some of the pain he held in to be seen by the psych, but not the cameras behind the mirror. Let the Sensex chew on that. Blake dutifully returned to his seat. The interviewer raised an eyebrow, then wrote something in the file. ‘Something that you won’t find in the records,’ Blake continued. ‘I visited each of the families of those eighteen men personally. Not all of them were exactly pleased to see me, as you can imagine.’ He cleared his throat. The interviewer glanced over to the mirror. Five seconds later the door opened and a glass of water was brought in. Blake appreciated the efficiency of the operation, and stole a few cooling sips. ‘Thanks,’ he said. Blake gave a short laugh. ‘Hell, I’ve taken orders from so many dumb assholes I think I should be able to take them from a smart one.’ Inside, he wondered if he could. ‘You lied. Your deposition after Kurana Bay. I watched the interviews over and over. We didn’t have Sensex then, but you were hiding something. You’re definitely hiding it now.’ He glared at Blake. Blake’s throat went dry. He suppressed a strong urge to cough, or look at anything but the psychologist. His mind raced, but he knew he couldn’t answer, not with the truth, at any rate. He was cornered. But he’d rather let this command slip through his fingers. There was only one way out. He stood up. ‘This interview is terminated,’ he said. Blake straightened, and walked to the door. ‘One more thing, Captain. A warning. Whatever happened in Kurana Bay – whatever really happened – you still carry it with you. It’s like a flaw in a diamond. Too much pressure …’ He didn’t finish the sentence.